Holy Eucharist Parish Centre is abuzz these days with volunteers preparing countless packages to be sent to Ukraine in time for Christmas. 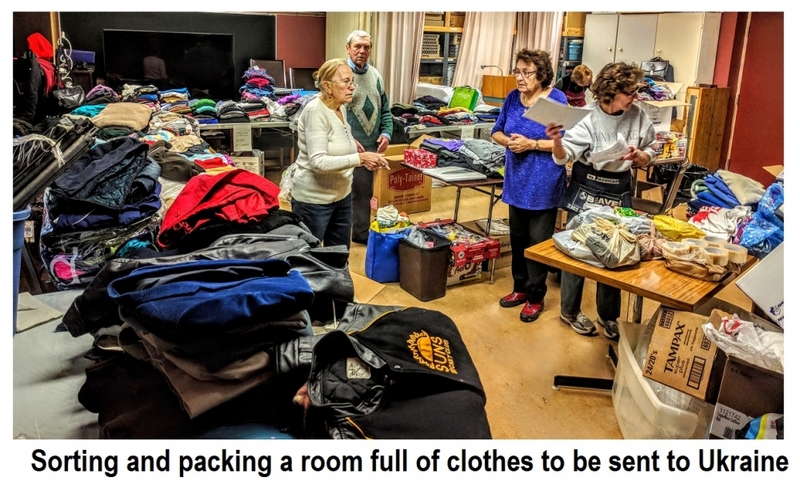 The available rooms are filled with tables stacked high with clothing donations for families and winter toques and gloves and, yes, some sweets and toys for the children. 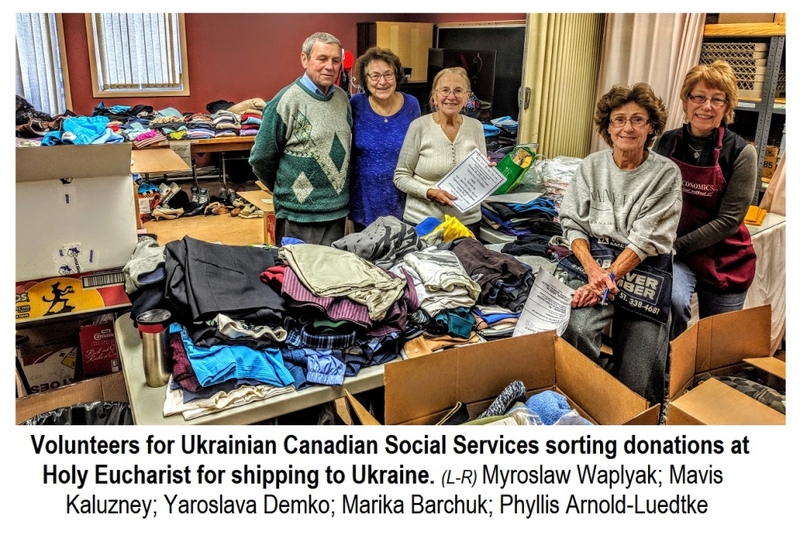 Two efforts are happily overlapping in their collaboration – the Winnipeg branch of the Ukrainian Canadian Social Services under the direction of Mrs. Yaroslava Demko and parishioners from Holy Eucharist Parish, led by Mrs. Mavis Kaluzny. The team with pani Demko is sorting through a huge room of good clothing donated by generous people from around Manitoba. From her part Mavis has been promoting the “shoeboxes’ from the global Samaritan's Purse organization that collects and sends shoebox-sized boxes of things to children around the world – including Ukraine. The boxes at Holy Eucharist are all earmarked for Ukraine. Holy Eucharist Parishioners have been doing the shoeboxes for a few years now. Parishioners are happy to donate great things for the boxes. They also donate money with which things are purchased that the children will love – things like: warm mitts, candy, toiletries, little toys and winter socks. This year the donations are going to the families that have been affected by the ongoing war with Russia. Over 10,000 soldiers have been killed and another 20,000 wounded. Their families struggle to make ends meet and these gifts from Manitobans will be at least a little relief as winter sets in…. and, for the children it will hopefully be at least a little joy as the feasts of St. Nicholas and Christmas approach… besides these families there are so many internal refugees fleeing the war in Ukraine's eastern provinces. Some estimates put the number around 2 million! So many families miles away from home, trying to live and stay warm and find food. 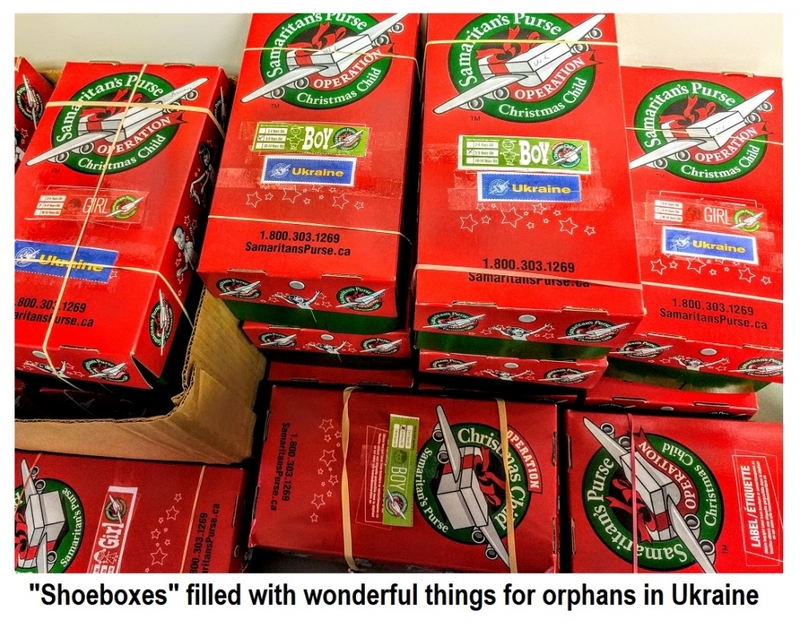 The boxes for the children are being directed toward Ukraine’s many orphanages. Mavis mentioned one of a hundred orphans... and another that is a place where, along with everything else, the children are blind. They reside there and prepare as best they can for the challenging life ahead. Those wishing to donate toward the boys and girls shoeboxes may call the Holy Eucharist Parish Office Manager, Carlene Deptuch (t. 204-667-8866). If some can help the Social Services send the many packages of clothing, call pani Yaroslava (t. 204-582-0138 or t. 204-661-3055).